The euro is a currency issued by the European Central Bank and shared by 19 EU-member countries: Austria, Belgium, Cyprus, Estonia, Finland, France, Germany, Greece, Ireland, Italy, Latvia, Lithuania, Luxembourg, Malta, the Netherlands, Portugal, Slovakia, Slovenia and Spain. Yet, while most proud citizens the world over can name the treasured faces, landmarks and animals immortalised on their beloved country's banknotes and coins, it is surprising how few Europeans know the names of the bridges and arches on their euro notes let alone that they are... well, not real. The euro currency consists of various coins as well as seven banknotes, each note depicting a different bridge. The images are meant to symbolize the close cooperation and communication between countries within the European Union, but also between Europe and the rest of the world. 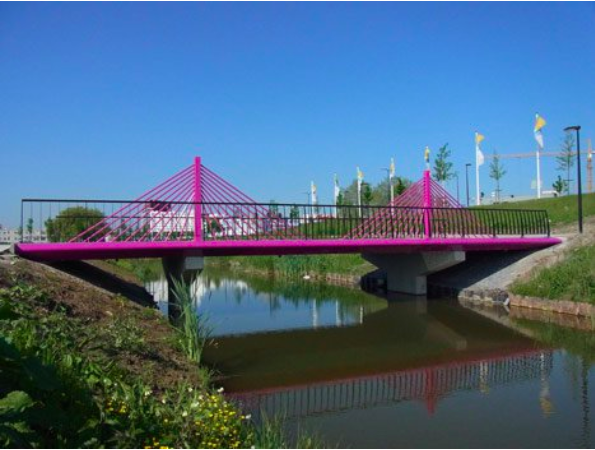 Dutch artist Robin Stam designed seven bridges, which were then constructed near a housing estate in the southern part of the Netherlands near Elementen, Spijkenisse. Rather than building them over a main canal or river that sees more foot traffic, the young designer's dream was to build the grandiose-looking bridges an oddly smaller physical counterpart, giving them a humorous angle. Literally! "But again reduced to the scale of the pedestrian and the cyclist. It gets a bit hilarious when you see a pedestrian walking over the cable-stayed bridge of the 500-euro bill. The pylon is just as high as it is. " After some deliberation, the council decided to splurge for Stam's set of rainbow spans. At $1.3 million, Stam's are about 25 percent more expensive than "catalogue bridges," but the council took a bet on publicity. "All the attention is more than worth it," the Spijkenisse alderman Gert-Jan ’t Hart, who spearheaded the project, said last year when Stam's bridges were under construction. "I wanted to give the bridges an exaggerated theatrical appearance – like a stage set," adds Stam, who poured dyed concrete into custom-made wooden moulds to make them. All seven bridges surrounding the development have been completed and are being used by cyclists and pedestrians. Stam says they have divided opinion among residents: "Some people's initial impression is that the bridges are ugly but when they find out the story behind them they find it really funny." Stam, Robin. 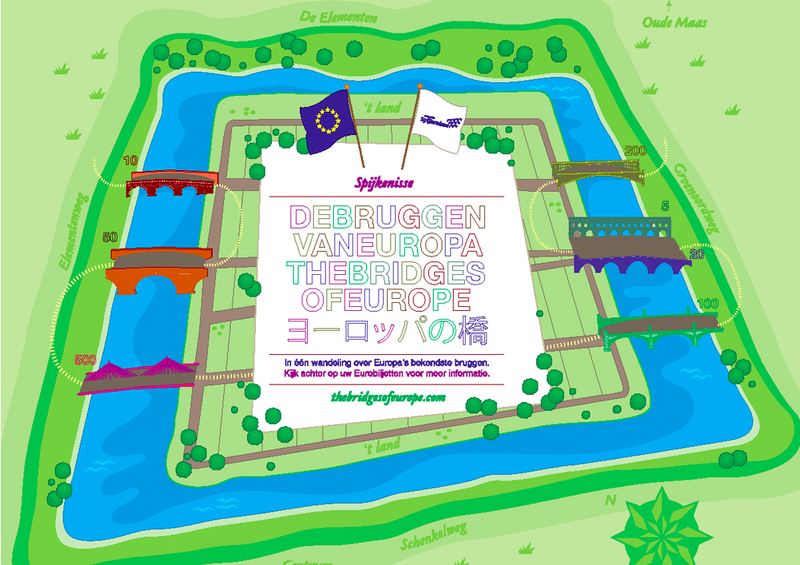 'Bruggen van Europa'. VISSCH+STAM. Electronically published 2013. Accessed January 13, 2018. Stam, Robin. 'The Bridges of Europe'. Robin Stam Tumblr. Electronically published 2013. Accessed January 13, 2018. Grabar, Henry. 'Europe's Most Famous Fictional Bridges, Brought to Life.' City Lab. Electronically published June 14, 2013. Accessed January 13, 2018. Griffiths, Alyn. 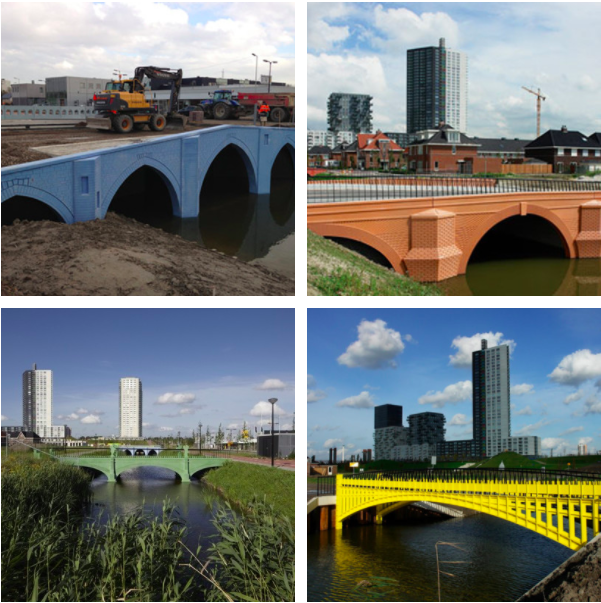 'Fictional bridges on Euro banknotes constructed in the Netherlands'. Dezeen. Electronically published June 5, 2013. Accessed January 13, 2018. Tissink, Ad. 'Interview Robin Stam: Met eurobruggen op de kaart gezet'. Electronically published July 5, 2013. Accessed January 13, 2018. So, you know about old cash, new cash, local cash and award-winning cash... but have you heard of brand cash? A creative mind hailing from France designed a beautiful set of brand-inspired mock banknotes, which got finance and fine art fiends in cyberspace wondering, what if companies became States and had their own currency?